Your home’s gutters protect it from the ravages of the weather, including rain, ice, and snow. Without an effective gutter system, your property is vulnerable to the elements, which can do a lot of damage — and do it much more quickly than you might realize. If you’re like most people, however, the idea of purchasing a new gutter system isn’t necessarily exciting. Unlike other exterior features, such as new windows or doors, gutters just don’t pack the same pizzazz. As a result, they tend to rank at the bottom of the list when it comes to upgrading the look of your home. That’s not to say that people don’t notice gutters. Old, sagging and discolored gutter systems can dramatically detract from a house’s beauty. On the flipside, a new gutter system can punch up any home’s curb appeal. Think of it like taking a long vacation: when you get back, people might not be able to pinpoint exactly why you look so rested and refreshed, but they will definitely notice a positive change. A new gutter system can do the same for your home. Furthermore, modern gutters, such as Englert® Gutter Systems, offer designer colors and options that provide more than just protection — today’s gutter systems deliver clean lines and eye-catching finishing touches while channeling water and debris away from your roof and your home’s foundation. If you’re wondering how much new gutters cost, you’ll need to consider a variety of factors. As with most exterior home renovations, there is no one-size-fits-all price for a new gutter system. Although you might be tempted to save money by installing a new gutter system yourself, experts warn that this is a big — and expensive — mistake. As Leslie Sellers, the president of the Appraisal Institute, told HGTV, “One of the worst things you can do is a poor job on gutter installation.” You might save money up front, but an inexpert installation is likely to expose your home to moisture, which can cause serious structural damage and even health problems. By spending a little more up front, you’ll have the peace of mind of knowing your property is protected. 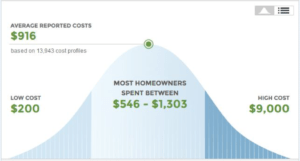 According to data gathered by HomeAdvisor, which analyzed the gutter installation cost of 13,943 projects, the average homeowner spent between $546 and $1,303 on a new gutter system. On the low end, homeowners spent $200 for new gutters. At the upper limit of the graph, you can see that homeowners spent as much as $9,000. One of the best ways to gauge the cost of a new gutter system is by talking to a roofing professional. Because gutters are an integral part of a home’s roofing system, a roofing expert will be able to help you determine which gutter system offers you the best combination of aesthetic appeal, durability, and cost-effectiveness for your property. At Nu Look Home Design, we never charge for estimates. Call today to schedule a free in-home estimate for a new gutter system for your home. You can reach our helpful, knowledgeable staff at (800) 279-5300, or email us at info@nlhd.com.